Jabba’s palace may seem like a fun place to visit, with the musical numbers and Throne Room slumber parties, but never forget: The Hutts are gangsters! If a shady deal goes south, the illustrious Jabba has several ways to ruin your day, including holding you prisoner in a metal bikini that leaves little to the imagination, and making you fight a Rancor for the entertainment of others. But perhaps the worst thing Jabba can do is take you for a ride on his party skiff to the Pit of Carkoon, and throw you into the mouth of the almighty Sarlacc. 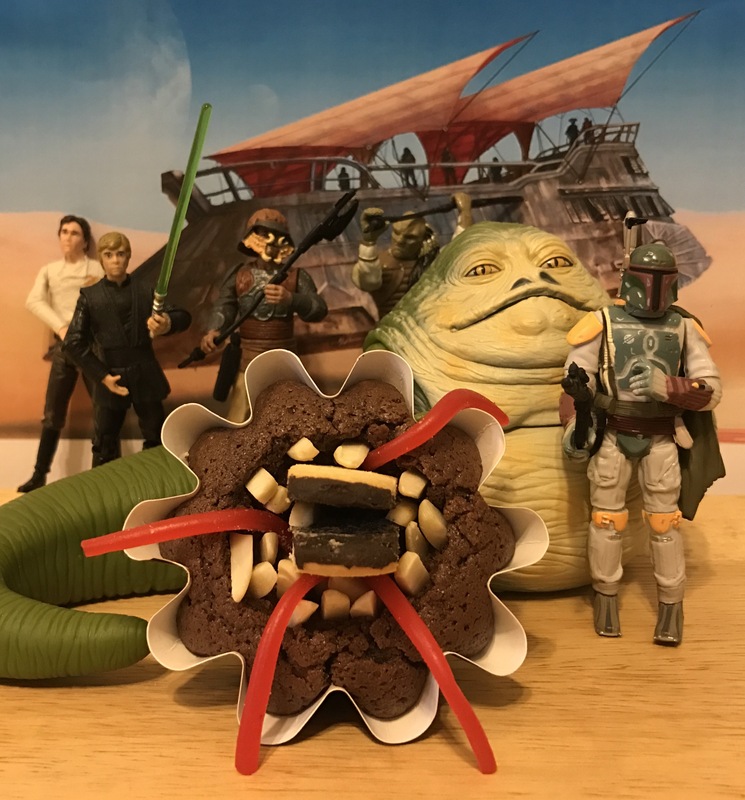 Fortunately for you, you won’t need a light saber, choke chain, or even a Lando in disguise (surprise surprise) to defeat these Sarlacc cupcakes. Perhaps you can even use them to work out an arrangement which will be mutually beneficial, and enable you to avoid any unpleasant confrontations. 1. Pre-heat oven to 325 degrees F. Line a cupcake tin with baking cups, and set aside. 2. In a medium-sized bowl, whisk together flour, cocoa powder, baking powder, baking soda, and salt. Set aside. 3. In the bowl of an electric mixer, beat the sugar and almond paste until well combined. 4. Add butter and beat until smooth and creamy. 5. Add vanilla extract, almond extract, and espresso. Beat until combined. 6. With your mixer on low speed, add eggs one at a time, beating well after each addition. 7. Add the flour mixture in 3 parts, alternating with the sour cream. Beat until well combined. 8. Fill each baking cup about 3/4 full. 9. Bake for 20-22 minutes, or until a toothpick inserted into the center of one of the cupcakes comes out clean. 10. Allow the cupcakes to cool in the pan for ten minutes before removing them to a wire rack to cool completely. 11. Once your cakes have cooled, use a paring knife to cut a cone shape from the center of each cupcake. Discard or eat cake cones. 12. Starting at the bottom of the hole, push almond slivers into the cake, around the circumference of the hole to look like teeth (about 4 at the lowest level). 13. Make another level of teeth a little further up in the hole, and keep going until you reach the top. I ended up with 4 layers of teeth. 14. Once all the teeth are in place, cut several Twizzler pull-n-peels to a length of about 2 1/2 inches, and place 3 or 4 into the cavity. 15. Cut a Milano cookie in half, then separate the layers. Trim the sides of the Milano cookie to make it a little bit more narrow. 16. Place the divided Milano cookie halves into the cavity to represent Sarlacc’s (special edition) beak. 17. Slowly digest these cakes over a thousand years, give or take.